People Reported the Florida Shooter, Like Trump Asked. He Still Got a Gun. 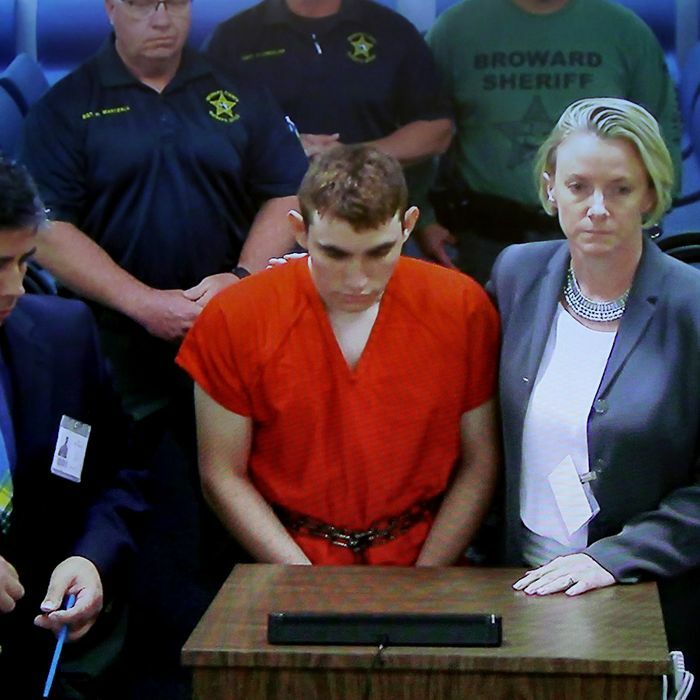 Suspected shooter Nikolas Cruz makes a video appearance in Broward County court on February 15, 2018. On the morning after a shooting at a Florida high school left 17 people dead, President Trump met our already rock-bottom expectations by posting a tweet suggesting that the fault lies with shooting victims and others who failed to report Nikolas Cruz, rather than with politicians who refuse to tackle the mass-shooting epidemic. As we learned more about the 19-year-old — who has confessed, according to the the Broward County Sheriff’s Office — it became apparent that Trump wasn’t just being appallingly insensitive, he was also casting blame on people who tried to alert authorities, and found a system that often fails to keep firearms out of the hands of troubled individuals. Cruz was adopted at age 2, along with his baby brother, by Lynda and Roger Cruz. His father died of a heart attack more than a decade ago, and his mother died of pneumonia in late October. After repeated suspensions, Cruz was expelled for unspecified “disciplinary reasons,” said to involve fighting and bringing bullets to school in his backpack. Math teacher Jim Gard recalled that administrators sent an email warning teachers about Cruz. Even the FBI investigated what now appears to be an early warning of the violence to come. Last fall, a YouTube user with the name “nikolas cruz” left a comment on a video posted by Mississippi bail bondsman Ben Bennight: “Im going to be a professional school shooter.” Bennight found the comment so disturbing that in addition to flagging it for removal by YouTube, he took a screenshot and tried to email it to the FBI. When it bounced back, he called the local FBI field office. Two FBI agents met with Bennight the next day, but he told them he didn’t know anything else about the user. A law-enforcement official told the Post that they didn’t feel they had the legal justification to issue a subpoena to YouTube for the user’s information. Then at some point last year, according to two federal law-enforcement officials, Cruz went to Sunrise Tactical Gear in Florida, passed a background check, and purchased the AR-15-style weapon he would use on his former teachers and classmates. Though plenty of people raised alarms with school officials, police, and federal agents, he had no criminal record, and no record of mental illness that would prevent him from purchasing a gun. Under federal law, someone can be put in to the background-check database if they’ve been involuntarily committed to a mental hospital, or if a government body has declared them mentally incompetent. Getting someone committed involuntarily, or even into mental-health treatment, can be extremely difficult. The question of when and how to keep firearms away from someone experiencing mental illness is complex. In the wake of the Florida school shooting, officials from Attorney General Jeff Sessions to House Speaker Paul Ryan to Florida Governor Rick Scott have made vague calls to address the role of mental illness in mass shootings, which is often how Republicans avoid talking about tightening gun-safety laws. The measures, known as “red flag laws” or extreme risk protection orders, have shown evidence of reducing suicides in Connecticut, where the first such law was passed in 1999, and in recent years have also been passed in California, Washington and Oregon. Eighteen states, including Florida, and the District of Columbia are considering such laws this year, according to a list compiled by Everytown for Gun Safety, a nonprofit advocacy group. Broward County Sheriff Scott Israel, who is leading the investigation of the Parkland shooting, pleaded with Florida’s lawmakers to pass such a measure on Thursday night.